The oval cut is, as the name suggests, oval in shape. That said, there are great variations in the oval diamond. Some are long and narrow, others are a fatter more rounded shape. Oval diamond rings, whether claw set or bezel set (with a rim), tend to have the diamond set lengthways down the finger. We have made ring designs with the diamond set east west across the finger too, but the oval cut tends to look more pleasing to the eye if kept in the normal direction. This is perhaps something to do with the symmetry of the hand. Oval diamonds have a very pleasing shape with no corners to worry about. Setting construction can be varied greatly with the diamond set as high or as low as the design requires. It is one diamond that has certainly not been exhaustively used, which means that it could represent a great opportunity in ring designing terms. There must be thousands of ring styles that are still possible with this diamond type that have yet to be made for the first time…it could be your chance to be truly unique. The selection process for this diamond still requires careful attention, with some specific issues to look out for. 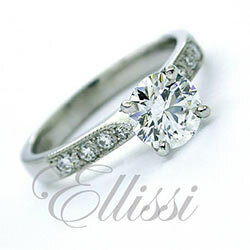 For more information on this cut, click on this link: Oval cut diamonds.